Elizabeth de Burgh, Duchess of Clarence, suo jure 4th Countess of Ulster and 5th Baroness of Connaught (6 July 1332 – 10 December 1363) was a Norman-Irish noblewoman who married Lionel of Antwerp, 1st Duke of Clarence. Elizabeth was born at Carrickfergus Castle near Belfast, Ireland, the only child of William Donn de Burgh, 3rd Earl of Ulster and Maud of Lancaster, Countess of Ulster. She was the last of the senior legitimate line of the descendants of William de Burgh. Her paternal grandparents were John de Burgh and Elizabeth de Clare, and her maternal grandparents were Henry, 3rd Earl of Lancaster and Maud Chaworth. Upon William's murder on 6 June 1333 she became the sole legal heir to all the de Burgh lands in Ireland. Actually, her kinsmen Sir Edmond de Burgh of Clanwilliam, Sir Edmond Albanach Bourke the Mac William Iochtar, Sir Ulick Burke the Mac William Uachtar became the de facto heads of the family and owners of de Burgh land during the Burke Civil War 1333-38. As Countess of Ulster she was raised in England and married Lionel of Antwerp, 1st Duke of Clarence on 15 August 1352 at the Tower of London. He was the second son of Edward III of England and his queen consort Philippa of Hainault. The couple had one child, Philippa, born on 16 August 1355. Philippa, who succeeded as Countess of Ulster, married Edmund Mortimer, 3rd Earl of March in 1368. 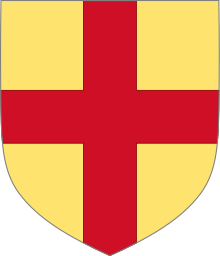 Both their titles passed to their son Roger Mortimer, and eventually through their granddaughter Anne de Mortimer, who married into the House of York. The House of York would base its claim to the English throne on their descent from Lionel of Antwerp. Elizabeth died in Dublin in 1363 during her husband's term as Governor of Ireland. She is buried in Clare Priory, Suffolk, England. ^ a b Curtis 2004, pp. 91–92. ^ a b Weir 2008, pp. 96. ^ a b c d e f Ward 2004. Curtis, Edmund (2004) . A History of Ireland (6th ed.). New York: Routledge. ISBN 0-415-27949-6. Weir, Alison (2008). Britain's Royal Families, The Complete Genealogy. Vintage Books. ISBN 978-0-09-953973-5.